All Biking Trails are now closed for the winter season! 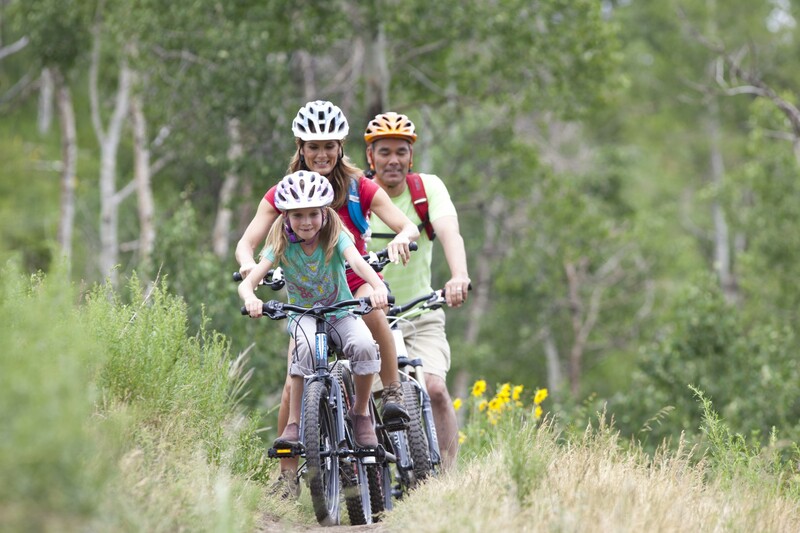 View and download Mountain Village’s summer biking map. Biking around Mountain Village is an outdoor marvel, bar none. For that reason our destination wins more and more accolades every year for its varied terrain and exquisite backdrop. In terms of access, most of our trails may be reached via gondola at San Sophia Station, and every cabin comes equipped with bike racks. If you need to rent or purchase a bike or bike equipment, visit one of our local retail sports shops in Mountain Village Center. But before you pedal off into this wonderland, we hope you take some time to review the Mountain Village Hiking and Biking Trail Map, and read about our bicycle safety requirements below, the Cyclist’s Code of Responsibility, and our Mountain Activity Safety guidelines. All bicyclists must maintain control of their speed and course at all times. It is the rider’s responsibility to avoid pedestrians, other riders and objects. Bikers should reduce their speed to a pedestrian’s pace when traveling through our plazas. From Lost Creek Lane near Mountain Village Center, this easy 2.5-mile trail begins on a paved surface and continues to Town Hall Plaza. Once at Town Hall Plaza, the paved trail becomes a natural surface trail and continues west towards Highway 145 and the entrance to the Town of Mountain Village. Watch for signage and pedestrian crossings. This scenic one-mile trail begins on the north side of Country Club Drive in Mountain Village and to the left of the Boomerang Trailhead (see below), then follows the ridge west and 300 feet down into the Meadows neighborhood. From Station St. Sophia, this rolling three-mile descent crosses several ski trails with great views to the west while traversing through aspen and spruce-dominated drainages. After crossing Prospect Creek Drive, this trail descends into a creek bottom, crossing the wetland on a boardwalk, and then continues down and connects with the Boulevard Trail, providing access to Town Hall Plaza and Mountain Village Center. Beginning at Station St. Sophia, this trail forks with the Sheridan Trail and continues left, past the snowmaking storage ponds and gate, for six miles on a dirt ski service road. There are 2,240 feet of steep climbs and descents past the top of Lift 5, the bottom of Lift 14, past Lift 12 and down through the ski area to connect with Prospect Trail. Vehicles may be encountered. Beginning on the north side of Country Club Drive in Mountain Village and to the right of the Jurassic Trailhead (see above), this steep one mile abandoned mining road descends through the Uncompahgre National Forest to the Valley Floor below. Expect a 700-foot elevation change. Ten miles in length and the longest single-track on the ski area, this trail begins at Station St. Sophia and traverses across numerous ski trails under Lifts 4 and 5 and into Prospect Creek. After crossing Prospect Creek, the trail climbs through dense forest to the top of Lift 10. This trail then continues two ways: either along the upper loop through Prospect Basin or a shortcut past the teepee and the top of Lift 10 before the descent begins to Station Village Parking and Town Hall Plaza. For a longer hike or bike, Prospect Trail also connects with the Boomerang Trail which leads to Alta Lakes. This two-mile trail begins at Station St. Sophia and continues to the right, where the trail forks near the top of Lift 4. It then follows a dirt ski service road to the winding, steep and paved San Joaquin Road, one mile from Mountain Village Boulevard. Vehicles may be encountered.